On the 50th Anniversary of Dr. Martin Luther King’s assassination, AFSCME and its affiliate unions like OAPSE remember the civil rights leader and the connection between him and our union. When he was killed, Dr. King was in Memphis to support the 1,300 striking sanitation workers who were members of AFSCME Local 1733. That strike had its origins in the tragic deaths of two Local 1733 members. On February 1, 1968, Echol Cole and Robert Walker sought shelter from torrential rains and a violent storm and were crushed to death in the back of their old sanitation truck when it malfunctioned. They had no pension, no workers’ compensation or life insurance. And the City of Memphis refused to provide any burial funds for these young men and their families. Their 1,300 co-workers decided enough was enough, and the Memphis Sanitation Strike was born on February 12. They walked off the job for Cole and Walker, but also for recognition of their union and dues deduction, wage increases, safer working conditions, a grievance procedure that included arbitration, and an end to racial discrimination in promotions and job assignments. For 65 days, the strikers were off the job. They marched, organized boycotts of city merchants and held sit-ins. 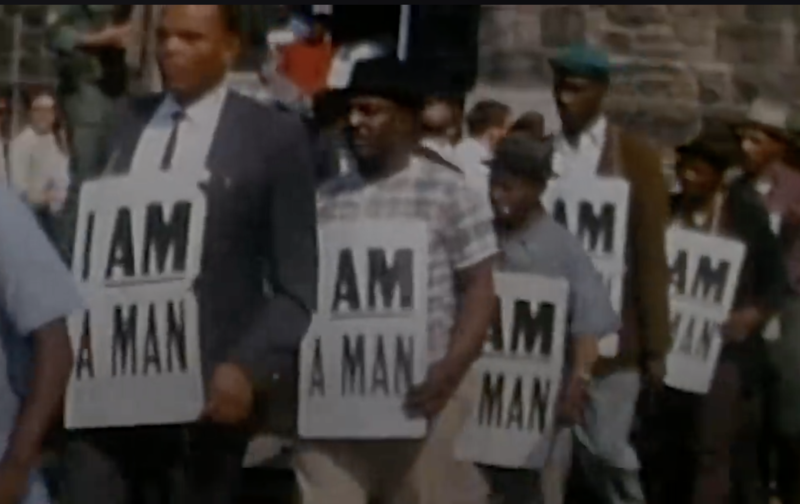 On March 29, Dr. King made his first visit to help the strikers, when he led 5,000 union supporters in the “I Am a Man” march through the city. Unfortunately, a few violent protestors broke windows and began looting. In the response from the police, a 16-year-old boy was killed by the police, and the city issued a curfew and called in 4,000 National Guard troops. On April 3, Dr. Martin Luther King Jr. traveled back to Memphis to support AFSCME sanitation workers in what was to be a non-violent march. That evening, he delivered his famous “I’ve Been to the Mountaintop” speech to a packed room of supporters. The next day, he was assassinated. Dr. King’s presence in Memphis and his words helped bring justice, dignity and victory to the members of Local 1733. 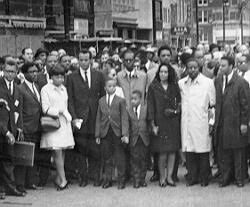 On April 8, 40,000 supporters silently marched through Memphis, led by Dr. King’s widow, Coretta Scott King, her children, Dr. Ralph Abernathy, co-founder of the Southern Christian Leadership Conference and Dr. King’s closest friend, and AFSCME International President Jerry Wurf. In the wake of the assassination and the march, President Lyndon Johnson sent the director of the department of labor to assist with negotiations, and the strike was resolved on April 16. Local 1733 members won recognition of their union and 15-cent per hour raises over two-years, in addition to other concessions from the city. As part of AFSCME’s I AM 2018 campaign, OAPSE members will participate in a national moment of silence on February 1 at 4:20 p.m. in recognition of brothers Cole and Walker and their ultimate sacrifice. Dr. King’s “Mountaintop” speech can be read in its entirety by clicking the link above. Below are just a few passages specific to the strikers and their issues. Now we’re going to march again, and we’ve got to march again, in order to put the issue where it is supposed to be. And force everybody to see that there are 1,300 of God’s children here suffering, sometimes going hungry, going through dark and dreary nights wondering how this thing is going to come out. That’s the issue. And we’ve got to say to the nation: we know it’s coming out. For when people get caught up with that which is right and they are willing to sacrifice for it, there is no stopping point short of victory.